THE social media was quickly overwhelmed with tributes and accolades for one of our nation's most renowned lawyers, Raja Aziz Addruse the moment news came in that he had passed away yesterday afternoon. Ungku, as he was fondly known within the legal fraternity, was indubitably a legal luminary and a doyen of the Malaysian Bar. His unequivocal commitment to the independence of the Bar and the independence of the judiciary - which are two essentials of the rule of law - is legendary. It is, therefore, not surprising that his departure is deeply felt by many lawyers, young and old, as Ungku could always be depended upon to speak up courageously for the Bar, and fairness and justice without fear and favour. It is no wonder that by popular request he became the president of the Bar three times between 1976-1978, 1988-1989 and 1992-1993. He was also a member of the Bar Council intermittently for 21 years. Born in Chemor, Perak on Feb 10, 1936, Ungku left for England in 1954 to read law at the University of Bristol. He was called to the English Bar by the Honourable Society of Lincoln's Inn in 1960. He returned to Malaya the same year to join the Federal Judicial and Legal Services as a deputy public prosecutor and later a Deputy Parliamentary Draftsman. 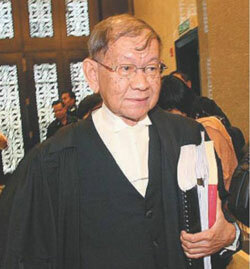 Six years later, he resigned and entered private practice after having been admitted to the Malaysian Bar on Jan 8, 1966. When he became the president of the Bar in March 1988, it was also one of the most tumultuous periods of the Bar with the dismissal of the then Lord President, Tun Salleh Abas and two senior judges of the Supreme Court as well as the suspension of three others. He not only represented Tun Salleh but stuck to his principle by refusing to appear in the Supreme Court when Tun Hamid Omar was Tun Salleh's successor albeit he was a senior counsel often sought after by many for major cases at the apex court. Though small in built, he was a giant of a man both in personality and character. He was always able to bring across his points of arguments forcefully and effectively but in a soft-spoken and courteous manner. When he spoke, not only the lawyers listened; the Bench too. Such was the respect the man was able to command from those who came into contact with him. Yet he was not arrogant. He was a true gentleman who believed in fair play and honesty in his dealings with the Bar as well as the Bench. He was most approachable, and was never condescendingly didactic and always acting as a role model and a patient teacher when imparting his skills and knowledge to the junior members of the Bar. Though an urbane gentleman, he was straight-forward and would not hesitate to speak out on various issues which were troubling him and the nation. In the late 1990s, he created controversy by speaking out against a spate of deaths by police killings. For this, he incurred the wrath of the then Prime Minister, Tun Mahathir Mohamad who told him off. But that was his hallmark - conspicuous intrepidity - perhaps partly due to his royal blood. In 2001, Ungku also openly criticised the appointment of Justice Ahmad Fairuz Sheikh Abdul Halim as the Chief Judge of Malaya when Justice Abdul Malik Ahmad who was then the senior most Federal Court judge was not appointed. One of his oft-cited quotes was about contempt of court in which Ungku argued that contempt of court should not be used to uphold the dignity of the judge but to preserve the purity of justice. That said, Ungku had also been acknowledged as one of Malaysia's most celebrated constitutional law experts. To Ungku, it was ironic that the freedoms said to be fundamental are less guaranteed when they are part of a written constitution if they can be easily amended by the executive in Parliament. Ungku was also a strong advocate of human rights having been the president of the National Human Rights Society (Hakam) from 1992 to 1997 and from 2000 to 2001. In May 2006, he was also elected as a Commissioner of the International Commission of Jurists. Ungku is survived by his wife Catherine, two daughters Azrin and Adeline, and a grandchild. I was indeed privileged to have had the opportunity to know him personally in the last few years. He had been a great source of inspiration to many, both within and outside the legal profession, and it would be a while before the void he left could be filled by a man of similar stature and greatness. Rest in peace, my legal hero. *The above tribute was first published in The Star on 13 July 2011.